Start off with a hearty breakfast at Café Bodega, a hidden gem located within the confines of the Sunaparanta Art Gallery. 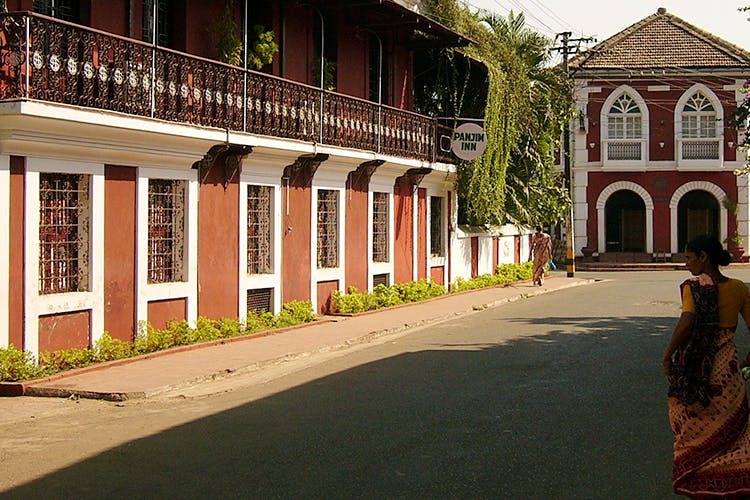 Located in Altinho, which is like the Malabar Hill of Goa, this is a lovely heritage building with the Al Fresco dining too. The café offers a nice variety of food whilst you enjoy the calm and beautiful surroundings of the Gallery. Also check out their exhibhits once you are done. You can even walk or ride around Altinho and check out the view from the top of the hill. Or even see the imposing Chief Minister’s or the Archbishop’s official residences. Next head down to the Church of Our Lady of Immaculate Conception. This is a beautiful and famous church, located in the city centre, and definitely worth checking out. From the majestic steps rising up to the church, to it’s pristine white colour with blue trimmings, this location definitely makes it Instagram worthy. Indulge in some retail therapy in the Panjim main market post your visit to the Church. From well-known brands to the local offerings, Panjim market has it all. So stock up on your alcohol, kajus or souvenirs whilst you shop here and enjoy the local ambience. Once shopping is done, then head off for lunch to the Crown Hotel Goa. Sitting atop a tiny hill, this hotel offers some majestic views of the Mandovi River whilst you sit poolside. The cool breeze, some King’s beer and the prawns will be great company here. The Latin Quarter of Fontainhas is now a Heritage Precinct and well worth a visit. Though a small area, it displays beautiful architecture from the bygone era. With tiny lanes and walkways, colourful buildings, few local bars and businesses, give this space so much character. And not to mention the beautiful Chapel located within the precinct. So walk around or do one of the professionally managed tours, and then head of to Panjim Inn or Viva Panjim for dinner or grab a drink at the famous Joseph's bar.